President Donald Trump has invited his Russian counterpart, Vladimir Putin, to visit Washington next year, US National Security Adviser John Bolton says. It is unclear if Mr Putin has accepted the invitation. The two leaders have met several times on the sidelines of international meetings but have held only one bilateral summit, in Helsinki in July. They are expected to meet briefly in Paris next month to mark the centenary of the end of World War One. Speaking at a news conference in Tbilisi, the capital of Georgia, Mr Bolton said: "We have invited President Putin to Washington after the first of the year  for basically a full day of consultations. What the scheduling of that is we don't quite know yet." Why might a visit be controversial? The invitation comes amid strained relations between the two countries. Mr Bolton visited Moscow earlier this week to convey US pla ns to withdraw from the 1987 Intermediate-Range Nuclear Forces (INF) treaty - a landmark nuclear deal. Russia denies Washington's claims that it has breached the treaty and has warned that withdrawal would be a "dangerous step". Are we back to a nuclear arms race? Reality Check: Where are the world's nuclear weapons? Special investigators in the US are also examining alleged Russian meddling in the 2016 presidential election. US intelligence agencies have concluded that Russia sought to influence the election in favour of President Trump. Russia rejects the allegations and Mr Trump denies there was any collusion. Earlier this month, the US government charged a Russian woman over her alleged role in a Kremlin-backed campaign to influence next month's US mid-term congressional elections. In an interview with Reuters news agency on Friday, Mr Bolton made a list of com plaints against Russia including its alleged election meddling; its involvement in Crimea and eastern Ukraine; the nerve agent attack on a former Russian spy and his daughter in the UK; and its involvement in the Middle East. "It will be helpful if they [the Russians] stop interfering in our election... get out of Crimea and the Donbass in Ukraine... stop using illegal chemical weapons to conduct assassination attempts against Russian exiles in the West, and if they would be less intrusive in the Middle East," he said. Mr Bolton said such behaviour was what had prompted US sanctions against Russia. 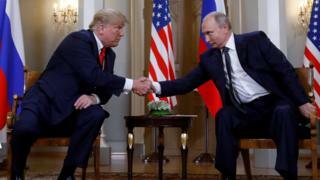 July's meeting in the Finnish capital was most notable for Mr Trump appearing to cast doubt on his own administration's assertions that Russia had interfered in the 2016 election. What was the fallout from Helsinki? It prompted a rare admission from Mr Trump that he had misspoken. Following that meeting, the White House said President Trump had issued an invitation for Mr Putin to visit Washington in the autumn. However, that was withdrawn amid an apparent lack of enthusiasm from the Kremlin, and claims in the US that Mr Trump was trying to be too cosy with the Russian leader. The latest packages were addressed to Democrat Cory Booker and ex-intelligence chief James Clapper.